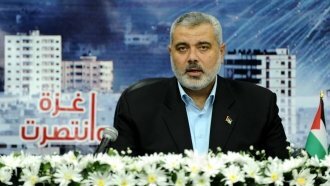 Israel says Hamas is to blame for the violence, but Palestinian leaders say Israel used force against peaceful demonstrators. Israel says it won't investigate the worst violence along its border with Gaza since 2014, despite calls for a probe from the United Nations and the families of those killed. At least 17 Palestinians had been killed and more than 1,400 had been injured as of Sunday. This all started after a planned protest turned violent. Palestinians planned to camp out along the Gaza-Israel border for about six weeks to protest Palestinian displacement. While the Palestinian Authority's president squarely blames Israel for the deaths, Israel says Gazan militants are using civilian protesters as cover for soldiers firing at the Israeli army. A spokesperson for Israeli Prime Minister Benjamin Netanyahu said the violence would end if Hamas, an Islamist group that controls Gaza, would step up. "All of this could cease right now. All Hamas has to say is, 'Don't approach the fence. Don't try to infiltrate Israel,' and no one would be killed," spokesperson David Keyes said. Palestinian leaders, though, say Israel made threats before the protest even began and had no reason to fire at demonstrators. "They represented no threat to the soldiers," Palestinian Parliament Member Mustafa Barghouti said. "Lethal weapons were used, and they were shot inside Gaza and not at the borders. This was a war crime by the Israeli army and it will not be tolerated." On Friday night, the U.N. called an emergency meeting because of the violence. The U.N. Security Council voted on a statement Saturday morning calling for an independent inquiry into what happened. The U.S. blocked it, though it's not clear if other countries would have done the same if the U.S. hadn't. Still, U.N. officials, including Secretary General Antonio Guterres, say there should be an investigation. Reuters reported Sunday that Israel's defense minister said there would be no investigation into the violence in Gaza.